Humanoid robots won the day at the DARPA Robotics Challenge, slightly outperforming their quadruped rivals at overcoming obstacles and completing tasks in a simulated disaster environment. South Korean team KAIST grabbed the top $2 million prize. Team KAIST’s transformer robot, HUBO, proved to be the most reliable and adaptable of the competitors, possibly due to its innovative design. The 5-foot-tall robot enjoys both humanoid traits, handy for various tasks such driving a car or drilling, and ones of a robotic vehicle, allowing it to quickly convert into a wheeled bot by simply kneeling, thus gaining in mobility. The winning droid was designed and produced in collaboration with the Korea Advanced Institute of Science and Technology (KAIST) Humanoid Robot Research Center and Rainbow Co.
Florida-based IHMC Robotics took second place and $1 million with its walking robot, Atlas, while Tartan Rescue team from Pennsylvania came in third, earning $500,000 with a caterpillar-wheeled transformer CHIMP. NASA’s Jet Propulsion Laboratory also competed with an impressive gangly-limbed RoboSimian capable of crawling and rolling away when needed, as well as clinging to objects with claws. However, that robot failed to put a plug into a socket, and eventually ran out of time on the obstacle course without scoring enough points to place. 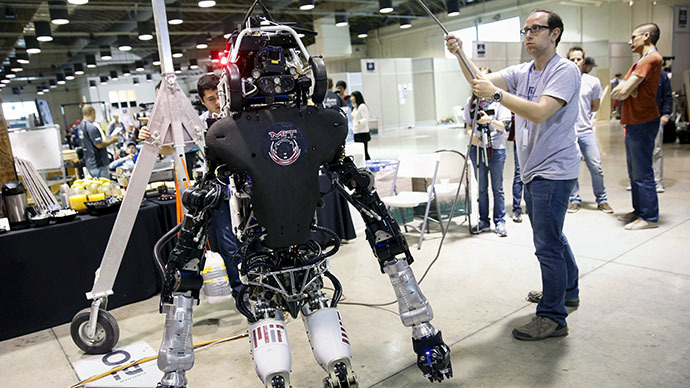 The DARPA Robotics Challenge on Saturday continued with a tough eight-task competition. Twenty-three robots were taking part in the finals, trying to score the most points on several courses, which simulate a disaster scenario inspired by the 2011 accident at the Fukushima Daiichi nuclear power plant. Robots had to complete the following tasks in under an hour: drive a vehicle, exit the vehicle, open a door, enter a building, locate and close a valve, cut through a wall, remove rubble or navigate tough terrain, climb stairs, and deal with a surprise task. The competition began on Friday morning at the Fairplex in Pomona, California and will wrap up Saturday evening. Four identical obstacle courses have been built to speed up the process, allowing for simultaneous competitions. After Friday’s rounds the top three teams were Tartan Rescue, Nimbro Rescue and Robosimian. About half the teams competing were US-based, and the rest came from Japan, South Korea, Germany and Italy. A team from mainland China withdrew from the finals, reportedly due to visa troubles. Many robots were seen falling over and the some of the teams decided to skip some of the more difficult tasks on the course, like operating a power drill. Robots that crawled, rather than walked, had a competitive edge, falling down less.